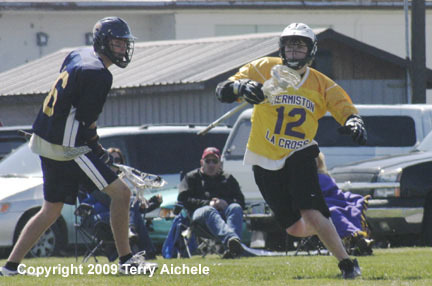 HERMISTON - The Hermiston Bulldog Lacrosse team defeated the Bend Lava Bears 7-6 in an overtime game on Saturday, April 4, 2009. 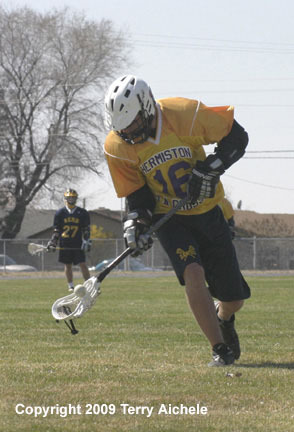 Hermiston had dropped the game on Friday at Summit by a score of 15-6. The Bulldogs appeared upbeat as they prepared for the start of the first home game of the season. Bend put a lot of pressure on in the opening moments of the game and scored the first goal within the openning two minutes of the first period. Hermiston came back in a couple minutes with Peyton Hobbs scoring for the Dawgs. The first period ended with the teams tied 1-1. Bend came back early in the second period scoring twice just moments apart. 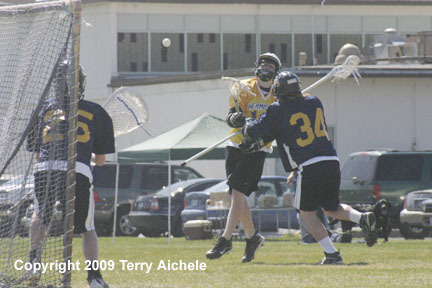 Nate Barak of the Dawgs scored the first of his two goals in the game at four minutes to go in the half. The Lava Bears then came back scoring back to back goals giving them the 5-2 lead at the half. The Lava Bears opened the second half with a quick score giving them the 6-2 lead. The Dawgs could have gotten down on themselves but instead they turned up their game. The forwards took the task of maintaining pressure on the Bend goal. 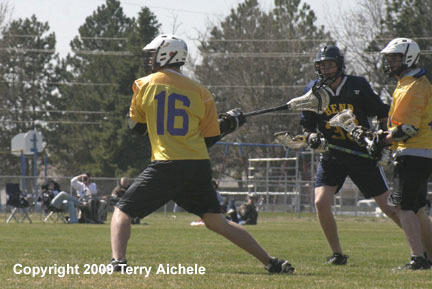 The action resulted in three goals in the third period. 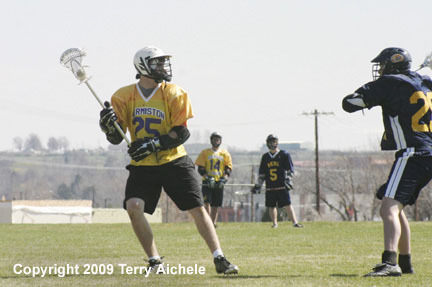 The first Dawg to score in the third was Zack Auvil in the opening minute. Next score came with about two minutes to go when Kyler Records knocked it in. 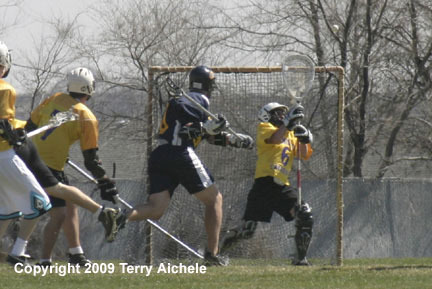 Nate Barak scored his second goal with just seconds to go in the third. The burst of scoring brought Hermiston to within one with Bend leading 6-5. 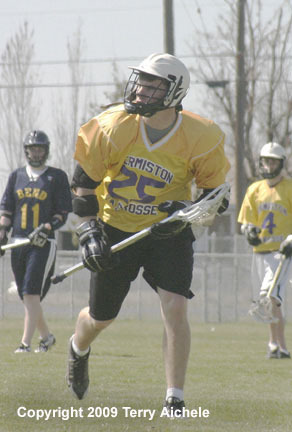 Ty Christiansen of Hermiston tied the match at 6-6 about two minutes into the fourth period. Neither team was able score in the remainder of the fourth period. Bend's last score came in the opening minutes of the third period and they hadn't been able to mount a scoring drive for the rest of the second half. Hermiston seemed to have the momentum going into overtime. 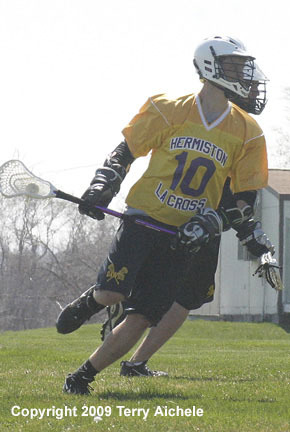 Hermiston, after all, was on a roll, scoring four times in third and fourth periods. Three minutes into overtime, Hermiston's Ty Christiansen, working around five yards in front of the goal, blasted the winning shot in. 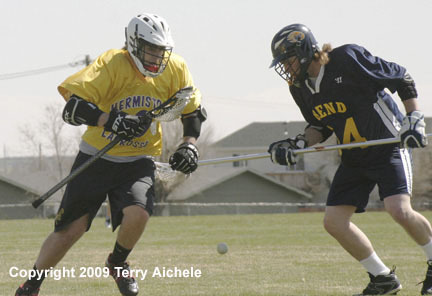 Hermiston, never leading until the final shot, took the hard fought win 7-6.